I learned about the importance of the federal budget during the government shutdown in 2013 by seeing my friends having to halt their work supporting refugees, trafficking victims and unaccompanied children. With the threat of a government shutdown again looming over border wall funding, I wanted to update what I wrote originally in April 2017 on what is at stake. For our government to function, a federal budget must be approved by Congress every fiscal year (FY). Over the last few years, Congress has been unable to pass a substantial new budget by the deadline, opting instead to pass shorter-term temporary Continuing Resolutions (CR). A CR only authorizes the federal government to operate with the same funding levels as the previous year. If more money is needed for specific purposes not already in the existing year’s budget, Congress decides whether to consider the funding increase. In January 2017, President Donald Trump signed multiple executive orders that severely limited the ability of individuals to seek asylum, increased the detention of migrants, actively separated children and families and expanded border enforcement. These executive orders are already being implemented, but continuing to do so in the future will be prohibitively expensive and require cuts to other important domestic or international programs to pay for them. Members of Congress continue to have the power ensure funds do not go toward policies that are harmful to the common good. As citizens acting on our faith values, we can hold our leaders accountable to good stewardship of public funds. WHAT IS GOING ON WITH THE FEDERAL BUDGET? Although FY2019 started in September 2018, the budgets of seven agencies, including the Department of Homeland Security (DHS), have not passed for the year. Congress has relied on short-term funding (CRs) instead. The latest CR ensures that these seven agencies have funding until December 21, 2018. If Congress and the Administration can’t agree on funding issues by this date, the government could shut down. The budget process for this fiscal year formally began when the White House sent Congress its budget “wish list” in February. HOW IS IMMIGRATION INVOLVED IN NEGOTIATIONS? 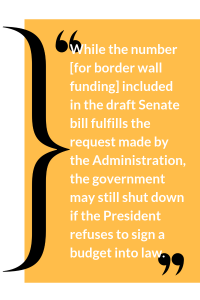 On December 11, 2018, President Trump threated to shut down the government over funding for a border wall in a conversation with Democratic leaders at the White House. At the core of this argument is a request from the President to provide $5 billion in funding in this year’s budget bill for DHS. 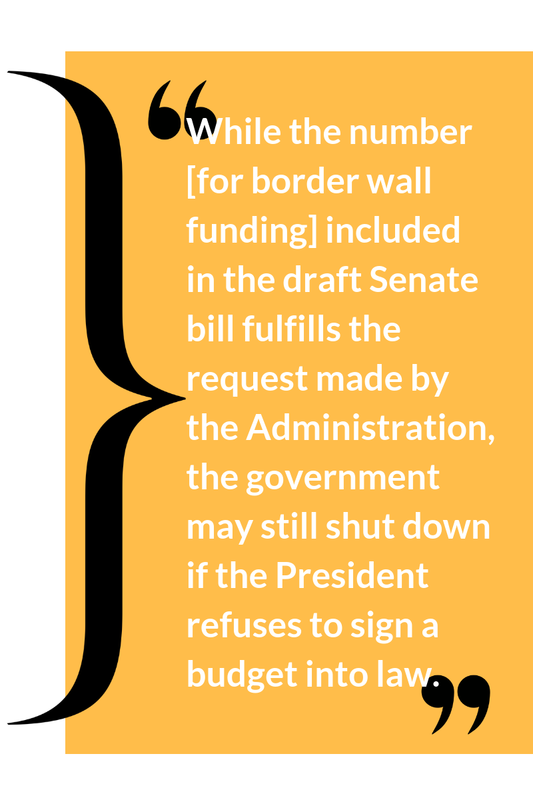 The current draft of the bill in the Senate version appropriates $1.6 billion for wall funding. This number matches the formal request that DHS made to Congress in February 2019. While the number included in the draft Senate bill fulfills the request made by the Administration, the government may still shut down if the President refuses to sign a budget into law. Churches and faith-based organizations, including ELCA Advocacy, have urged Congress and stood together against funding for a border wall. DHS funds, including those for the border wall, come at the cost of programs that could help people living in poverty or in rural communities. 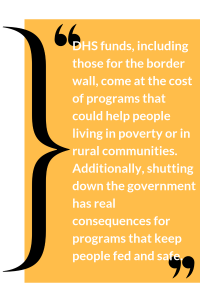 Additionally, shutting down the government has real consequences for programs that keep people fed and safe. People of faith across the country should continue to urge members of Congress to approve a moral budget that reflects our values and advances the common good. WHERE DOES THE ELCA STAND? As a church, we serve society when we “hold power accountable, advocate justice, stand with those who are poor and vulnerable, provide sanctuary, and meets human need” (ELCA social statement: “For Peace in God’s World”). We stand firmly against inflicting harm in all communities by cutting funds for programs that serve vulnerable people or defunding programs that better the conditions that force people to flee their home countries.We stand for a budget that honors the image of God in each person. Keep up with what is going on. Join the ELCA Advocacy Network to receive updated information and action alerts. Call your member of Congress now and urge them to reject additional funding aimed at separating families. Pray every day for all legislators that shape policy and for the communities that live with policies’ effects. ELCA Advocacy is grateful to our author, Alaide Vilchis Ibarra, who has shared her insights in this blog post update and will be leaving ELCA Advocacy at the end of this year. Her dedication and contributions over the past 4 years have been a compassionate presence in a heated climate, from helping shape the ELCA AMMPARO strategy to raising a compelling voice for social justice on Captiol Hill.